Coatlicue’s Legacy commemorates the 50-year anniversary of the 1968 student walkouts in Los Angeles. The image shows a graduation procession of significant cultural icons of historically marginalized communities of color. 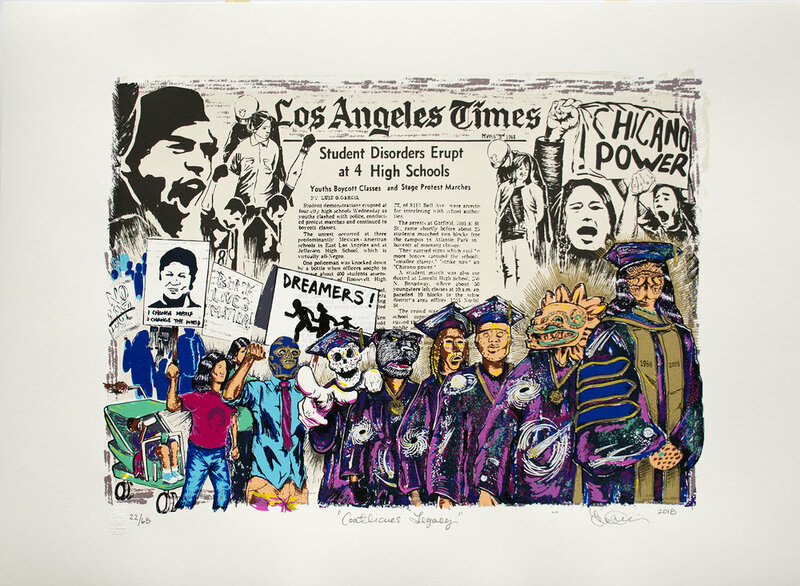 Drawing on the original “Chicano Power” poster of the walkouts and archives from the demonstrations, he modifies a newspaper collage to reflect the political realities for people of color in 1968. Luis Genaro Garcia draws from the socio-political subject matter of Jose Guadalupe Posada and David Alfaro Siqueiros to paint in a “Social Surrealist” style that depicts working class people through metaphorical concepts. As an educator he teaches the arts through a social justice curriculum that accounts and validates the ethnic, personal, and historical experiences of working class students. He is a high school art teacher in South Central Los Angeles currently pursuing a PhD in education at Claremont Graduate University.